Objects of Wonder brings together a wide range of international artists whose work exhibits strange and unusual functions, engaging in conceptual phenomena like time, light, energy, evolution and changes of state. Artists deploy thermo dynamic explosions, asteroidal activity, fluid turbulence, insect behavior, natural selection and gravity to generate astonishing sculptures, drawings, paintings, videos, sound art, gadgets and installations that reveal the wonder of everyday phenomena. What is the connection between a perpetual coffee cup vortex (Antony Hall) and a coordinated array of bouncing basketballs (Pascal Sisto)? What does a virus-inspired doily (Laura Splan) have to do with the purposeful genetic engineering of new species for humankind’s zoological desires (Kathryn Fleming)? In juxtaposing a diverse group of artists who attempt to chip away at the mysterious stuff of everyday life, we are left with Objects of Wonder. Objects of Wonder is curated by Beall Center Artistic Director David Familian and guest-curator Madeline Schwartzman. Madeline Schwartzman (filmmaker, writer and architect) is the author of See Yourself Sensing: Redefining Human Perception, an explosive and timely survey of fifty years of futuristic proposals for the body and the senses. The follow-up to that book— See Yourself X—will be released by Black Dog Publishing, London, in the fall of 2015. She teaches at Barnard College and Parsons: the New School for Design and is the founder and curator of a poetry project called 365 Day Subway: Poems by New Yorkers, featured on PBS and in the Wall Street Journal. An upcoming book of that name is in the works. 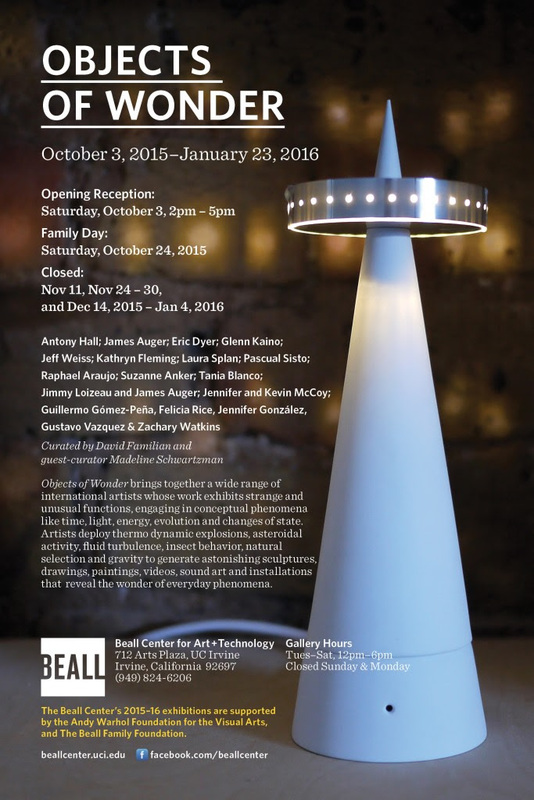 OPENING RECEPTION: Saturday, October 3, 2015, 2pm-5pm. Free and open to the public.